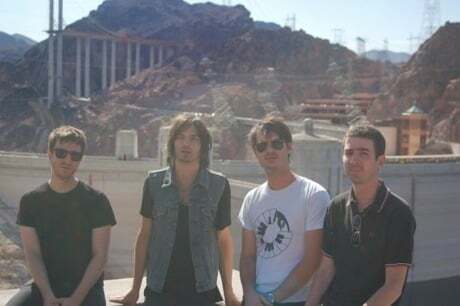 It's more than three years since we heard a peep out of Phantom Planet, as the Los Angeles pop-rock crew went on hiatus back in late 2008. The band will soon be ending their silence as they plan to make their return in 2012. The band posted a rehearsal video that shows them running through part of the song "Knowitall" from their 2004 self-titled LP. The video is tagged "1st Rehearsal Since Hiatus." The description accompanying the video reveals that the 2012 reunion will include "a few shows." They might even record a new EP, but this is currently unconfirmed. You can follow the progress of the reunion over at Phantom Planet's newly-minted Twitter page. The reunion has evidently been quietly underway for a couple of months now, since the account was started in early November. They have promised to unveil a new rehearsal video soon, this time showing a full-song performance. Somebody request "California" for us. And in case you were wondering -- no, the reunion doesn't include actor and former band member Jason Schwartzman on the drums. Jeff Conrad will once again be behind the kit. Thanks to Punknews.org/Property of Zack for the tip. The band has posted a rehearsal video that shows them running through part of the song "Knowitall" from their 2004 self-titled LP. The video is tagged "1st Rehearsal Since Hiatus." The description accompanying the clip reveals that the 2012 reunion will include "a few shows." They might even record a new EP, but this is currently unconfirmed.